There are also some optional advanced settings that you can set. To access these advanced settings, press the "Advanced Settings" button. This should open a new window. 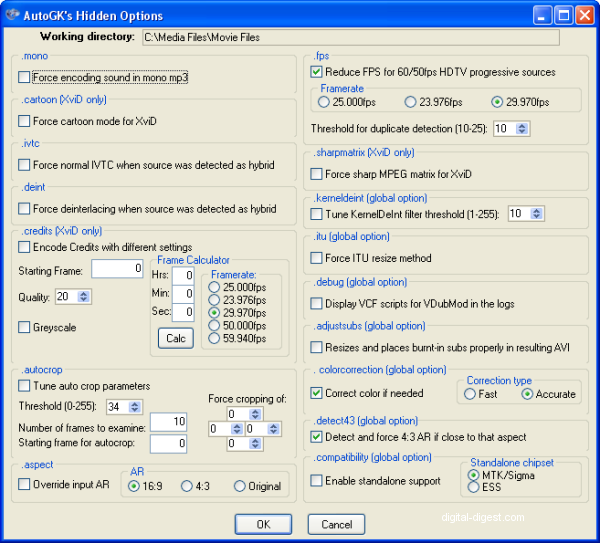 The Resolutions settings options determine the video resolution that AutoGK will use. Setting it to "Auto width" will let AutoGK determine what is the best resolution to use, given your current selected output file size - this is the best option to use. Selecting "Minimum width" or "Maximum width" allows you to specify the minimum or maximum width that AutoGK is allowed to use when encoding your video. The "Fixed width" option allows you to set a fixed width that forces AutoGK to use. Using a setting other than the "Auto width" setting may decrease quality if not used properly (remember that a high resolution + small output file size = bad quality). The Codec setting allows you to select either the DivX or XviD codec to use. The Audio options determine the audio encoding options AutoGK will use. The "Auto" option will use 128 kbps VBR (variable bit-rate) MP3 audio for 1 CD movies, keeping the original DVD AC3 audio (if available) for 2 CD or larger movies. Alternatively, you can force AutoGK to use AC3/DTS/MPA or VBR/CBR MP3. AC3 does not offer the best quality versus file size ratio, so using VBR MP3 at 128 kbps for 1 CD movies and 160 kbps for 2 CD movies is the recommended setting. Finally, the Subtitles options allow you to configure two settings related to the subtitles. The "Display only forced subtitles" option will make sure only forced subtitles (eg. those that are displayed even if you turned off subtitles on the DVD - typically for when a character speaks in a foreign language). The "Use external subtitles" option will tell AutoGK to use internal subtitles (subtitles selected will be burned onto the video, and hence, can't be turned off/removed at a later stage) or external subtitles where the subtitles is stored in a file and requires an external software to display the subtitles. Now press "OK" and close the "Advanced Options" window. Take note of the "Preview" button - this allows you to see a preview of what the final output will look like (complete with subtitles). Using this option is a good way to make sure you haven't made any mistakes prior to the actual encoding (which will take a long time, so there's a risk of time wasting if the settings aren't correct). .credits - this XviD only options allows you to set a different encoding standard for ending credits of movies (which require less bitrate/quality) than the actual movie. You can set which frame the credit starts (or use the Frame calculator to calculate when it starts), set a quality setting (lower = worse quality) or even encode in black and white. .autocrop - this option determines how AutoGK does auto cropping, or you can force a crop setting to be used.